Some epics have lived long enough to grown timeless and priceless in stature. Mahabharata & Ramayana are couple of them. Mahabharata talked about because of the nature of it's vivid jabs about life and turmoil which leads to chaos and talks about "dharma" and 'adharma" in person. 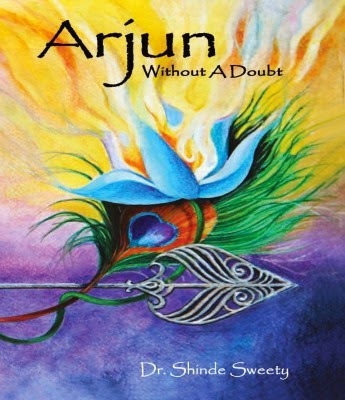 Author Dr. Shinde Sweety in her book "Arjun:Without a Doubt" traverses a path less explored and gives readers to something to hold on to. So how does it feels to be on a road very less traveled? Let's find out. I knew there was nothing poetic about death. I knew not that the most horrific battles are fought off the battlefield. Arjun the idealist in a non-ideal world, the warrior whose deadliest opponent was his conscience. History forgot his voice, but misquoted his silence. My self esteem originates from me and ends in me. Why does your honor depend on me? Find your own. Draupadi the untamed tigress, the fragrant flame, the unbridled spirit. Power does not justify sin. Power is not virtue. Virtue is that which lasts in spite of power. Krishn the enigma whose unique ideology churned the battlefield into a quest for truth. The missile the trajectory the vision. The trio that makes for the core of the Mahabharata (Indian epic). First look at the title and the cover and not much can be looked beyond the vivid colors of the cover. It's pale and dull and offers no bright scope. The title reveals a lot about what the book is going to be in a very short spell. The blurb talks about three people from Mahabharata and their point of views which are to be detailed in the story. It's a precise blurb which never shifts out of focus and nags the reader to go for the book. The story is set in the time of Mahabharata and tries to lend voice to Arjun, one of the timeless warriors of the epic. He is duly assisted by Draupadi and Krishna who lend voice to his concerns and try to unravel the facts and myths concerning the epic which have eluded many over the years. The story embarks on a journey which might change the entire landscape and the ongoing tussle of how to look up to Arjun after his glorified and mystified tales. The book has a subtle expression to it. The pain and sorrow is evident when the words are meted out from the narrators to the readers. It connects the missing dots which evidently or unknowingly have been washed away with the tides of time. The Krishna & Arjun chemistry and above it all the Arjun & Draupadi relationship sheds ample light on what happened back then and why it happened altogether? There are few surprises in the mix which catches readers off guard and staunch followers of the epic can relate to them with ease. It gives a different scenario to tackle with and lead to ultimate salvation and the talked about nature of the story. The book's language is an added plus to the story. The downside of the book is its familiar notions coming into play. Once the book settles down and tries to uncover the entire mystery behind the saga and small crucial elements, it tends to tread on the paths of well known events and occurrences which numerous people have gone through again and again. The melodramatic spike in the expectations too fizzle out by the end of it all as facts remains facts and Mahabharata remains Mahabharata. All in all if Arjun didn't had a source till now to showcase his prowess and plight, the book helps his cause. If Krishna's actions are to be justified concerning Arjun, then the book tries to say it all and if Draupadi played a part in Arjun's life then this is where you can find it with ease. But then it all doesn't change the history and no matter what the consequences or repercussions of their actions it all comes down to the fact that Mahabharata was victory of good over bad. The book is a source to enlighten and refresh the minds. It's not a sparking revelation but a fine tuned version of the epic. Thank you, Meghant. I'm glad you did decide to call the Mahabharata as 'History' rather than Mythology. I believe in that fact too.